The CB Cares Educational Foundation is looking for motivated and talented middle school students to submit a video addressing the dangers and negative effects of vaping and ways to avoid peer pressure. The video should be about the dangers of vaping, highlighting at least one consequence that will result from the choice of vaping. Videos will be judged by content, production, quality, and creativity. Vaping is the popular term for using electronic cigarettes or vaporizers – devices that heat up small quantities of liquid, oil, or leaves until they produce an inhalable vapor. Vaping has become a major problem and much of the advertising is directed specifically to kids and teens. Vaping contains harmful chemicals and the goal is to help students understand prevention is key. Also, it is ILLEGAL for anyone younger than 18 years to vape! The actual act of vaping is NOT allowed in submission video. Videos should be between one and two minutes long. Students must submit the video via email, with a completed official entry form. You may use either of the following formats: MOV or MP4. 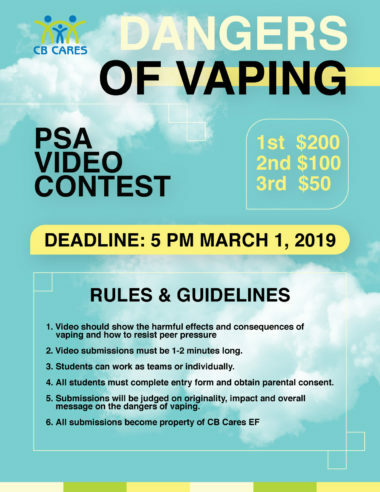 Videos must be downloadable and may be submitted via Dropbox and Vimeo with the link emailed to info@cb-cares.org and CBCaresVolunteerTeens@gmail.com with the subject line “Vaping PSA Contest” before 5 p.m. on March 8, 2019. The official entry form must be signed by the student and his/her parent/legal guardian. For any questions, please contact Kimberly Cambra at kcambra@cb-cares.org or at 215-489-9120.